Winner of the Tony "Triple Crown" for Best Musical, Best Score and Best Book, Avenue Q School Edition is part flesh, part felt and packed with heart. The laugh-out-loud musical tells the timeless story of a recent college grad named Princeton, who moves into a shabby New York apartment all the way out on Avenue Q. He soon discovers that, although the residents seem nice, it's clear that this is not your ordinary neighborhood. Together, Princeton and his new-found friends struggle to find jobs, dates and their ever-elusive purpose in life. 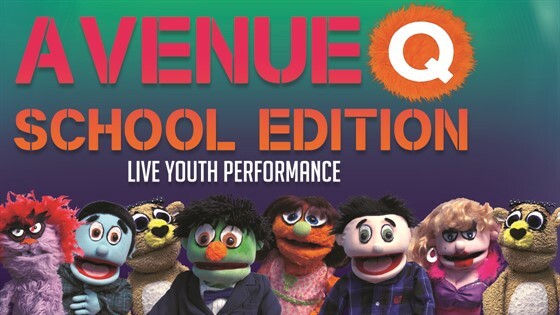 Because the original Avenue Q has some content elements that have previously made it a difficult choice for some high school productions, MTI worked with the Avenue Q authors to create an adaptation that maintains the dramatic (and comedic) intention and integrity of the piece, while editing it to make it more appropriate for high school audiences and performers.